Loyal visitors...we continue to record 2000 or so "hits" weekly. We presume many are bookmarking our possible new site. BREAKING NEWS...It looks like trouble ahead for our site here. For a year now we've been growing thanks to loyal visitors and contributors. Thousands have responded to our survey and visited our growing links files. Trombonists world over have joined in our delightful crusade. Thinkers, poets, wash room attendants, and environmentalists have provided feedback and contibuted time and effort to TROMBONISTICALISMS. We have recorded, on more than a few occasions, OVER 800 "hits" per DAY and averaged 400 per week for months on end. "They" may be pulling the plug on us here. Talk of freedom is troublesome. Intemperate comments by Board of Directors President Frankie Crooks notwithstanding we are not overly concerned. Our numerous loyal contributors, visitors, and fans will find us again, PERHAPS at http://www.TROMBONISTICALISMS.coolebrity.com. We expect the USA to be drilling here soon...possibly right thru some of our staffs heads in the quest for SUV fuel. Fortunately we are "very well connected" and don't expect any major difficulties. It's a dirty little secret that there is oil under us here at the Magantic North Pole. The fellow in the picture [look for it] who's removing the ice? He was sneaking out with crude at the end of his shift. He'd put it in his thermos and take it back to his bunk. There really was no need to be sneaky about it as we have no rules here about removing oil from under the plant. He actually was doing us a favor. Well, I do go on. Continued special thanks, however, must be expressed to Mother Nature herself or, perhaps better expressed as the natural laws at work at the "top of the world". It is here, and only here, that our TROMBONISTICALISMS three axis configurations will provide the greatest spacial information far superior to field sensor or single axis gradiometer sytems found in more temperate latitudes. Our manufacturing assemblies are mounted in titanium tubes for maximaum stability. Tube assemblies are supported at ideal mounting points within sealed enclosures of composite materials with high tensile strength. Cds masters manufactured at our plant at the precise site of the Magnetic North Pole have a resolution of better than 3nT, bandwidths of 2kHz and operate in high gradients which are detrimental to other magnetic sensors designed for the location of buried ordinance, brass instruments, i.e. trombone, depth of bury measurement AND geophysical surveys. 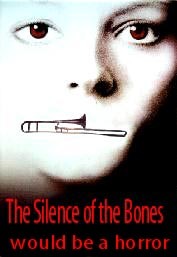 Whenever and wherever our site reemerges on the internet there will always be a TROMBONISTICALISMS. case, AT the magnetic north pole are far superior to all others. As ever TROMBONISTICALISMS is seeking motivated persons for the purpose of employment. Consult our job listings if that means you. Enjoy our art pages featuring trombone related original art work. Send us some if you want. All of us here at TROMBONISTICALISMS are interested in hearing from you. 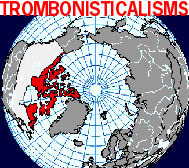 TROMBONISTICALISMS is the premier site for trombonists, free improv, and the Arctic. Email us and/or use our handy sign up page. Thank you. ...Well, in conclusion, there is much to see here and it's always changing, growing, and, we hope, improving. Keep your submissions and comments coming. Thanks.